Editor's note: if ever there was an icon for "eye candy," believe this might be it. :) Happy Friday to our Flickr friends! One of the more spectacular scenes of the Aurora Borealis was photographed by one of the Expedition 40 crew members aboard the International Space Station from an altitude of approximately 223 nautical miles on July 15, 2014. 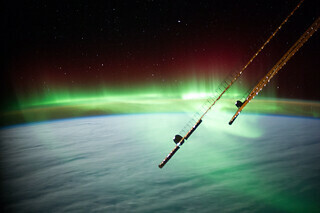 The crew member used a 50mm lens to record the image as the orbital outpost was over a point south of Australia. Parts of solar array panels of the space station are visible at right.